Read the definitive edition of Bilbo Baggins’ adventures in middle-earth in this classic bestseller behind this year’s biggest movie. 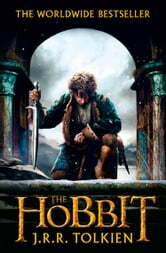 The Hobbit is a tale of high adventure, undertaken by a company of dwarves in search of dragon-guarded gold. A reluctant partner in this perilous quest is Bilbo Baggins, a comfort-loving unambitious hobbit, who surprises even himself by his resourcefulness and skill as a burglar. Encounters with trolls, goblins, dwarves, elves and giant spiders, conversations with the dragon, Smaug, and a rather unwilling presence at the Battle of Five Armies are just some of the adventures that befall Bilbo. Bilbo Baggins has taken his place among the ranks of the immortals of children’s fiction. Written by Professor Tolkien for his own children, The Hobbit met with instant critical acclaim when published. This book is super beast!! A must have book!!!!!!! so good that I read it for 2 hours and i just couldn't put it down!! It is so worth your money!! buy NOW!! I really enjoyed the adventures of Bilbo Baggins, Gandalf and the other 13 dwarves. YOU MUST BUY IT RIGHT NOW!!!!! Search in the library of your Kobo or kindle IMEDIATELY! So stop reading this review and buy the Hobbit ! p.s after you've read the book watch the movie it's just as good as the book. BUY THE HOBBIT RIGHT NOW. In my experience of great books I must admit The Hobbit is one book I would really read again and again and still be surprised! The book now makes me want to read The Lord of the Rings, a trilogy I have yet to experience the thrill of. The Hobbit is very exiting and kept the reader (me) entertained through out the book! Many people, young and old, will enjoy this book and I will surely mention it to my friends, something you should do too. One of the absolute classics. Tolkien has inspired generations of writing with his tales of hobbits and their adventures. A story for his children, where the hero would be considered no greater then a child. I have spent many hours pouring over Tolkien's story and have never tired of it. No matter how many times I travel back to Middle Earth.